Brimming with confidence, chef and co-owner of the village eatery, Paul Miranda, employs this philosophy to ensure that his food fully satisfies his diners. Largely self-taught, Miranda said he previously went to culinary school for a semester, but dropped out. Since then, he has worked all over the country, including as the former executive chef at Swallow restaurant in Huntington. He emphasized that, if a diner asks for a certain dish to be modified, he will personally visit their table and explain why the dish includes those ingredients. He would prefer his guests experience the meal as is, to fully savor the experience and the thought-out arrangement of its constituent parts. The buttery, soft Burrata ($13) is a small plate served with compressed cantaloupe, crispy prosciutto and arugula pistachio puree. The mozzarella outer layer gives way to a silky smooth cream that takes on hints of sweetness from the cantaloupe and a savory speckle from the prosciutto. The Chicken Wings with Red Dragon sauce were crispy, yet tender and packed with a spicy, almost herbal flavor that adds complexity to a traditional small plate. The Chicken Wings ($14) with Red Dragon sauce was a masterful rendition of the classic bar staple. The crunchy skin gives way to a hearty meat that pulls apart easily, with a secret blend of spices that a saucy punch. 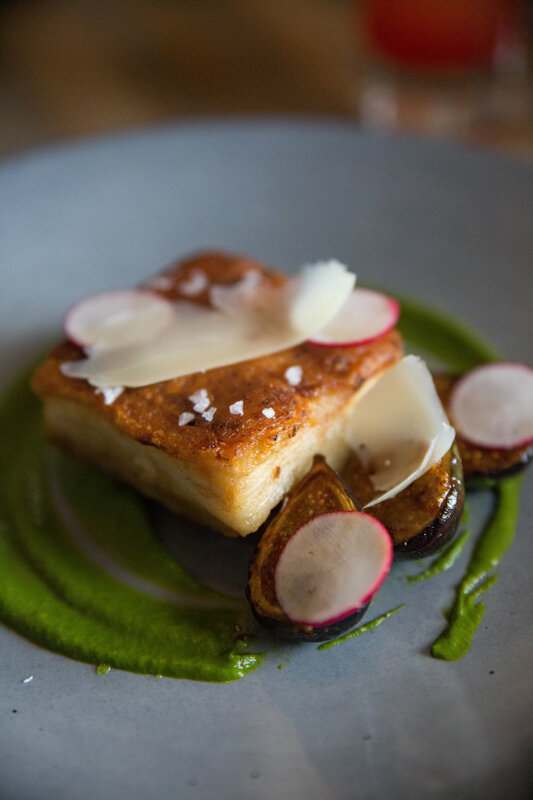 The Olive Oil Braised Pork Belly was a decadent, yet balanced treat, served alongside warm roasted black mission figs, aged provolone, broccoli rabe and pink peppercorn honey. The Olive Oil Braised Pork Belly ($15) features succulent slices of pork complemented by a medley of roasted black mission figs, aged provolone, broccoli rabe and pink peppercorn honey. These elements meld together to balance the savory, sultry taste of the pork with lightly sweet aromatics that make this a truly elegant small plate. The Ramen at True North is deliciously brewed with pork belly, pork shoulder, soft boiled egg and crispy ginger. It was the result of Chef Paul Miranda’s quest to find the best ramen bowls in Chinatown. The Ramen ($17), made with pork belly, pork shoulder, soft boiled egg and crispy ginger, is a product of Miranda scouring 15-20 spots in Chinatown for the best ramen over two weeks. He picked the best qualities of the various dishes he sampled, combining them to create a ramen with fresh ingredients steeped in a rich, complex broth. “When I decided to make this one, I pulled all the things that I loved from all these different ramens and put it into this,” Miranda said. The burger at True North is served between a fluffy brioche bun, with a flavor medley of red onion marmalade, Manchego cheese and black garlic aioli. The serrano ham gave a bold under layer to the beef, with the arugula throwing in a fresh zest. The Burger & Fries ($21) were no ordinary gastropub burger. Served on a warm brioche bun, the tender beef is served on an under layer of delicately thin serrano ham, topped with arugula that brings the dish a zesty, natural spice. The red onion marmalade brings a mild accent that balances the bolder flavors of the black garlic aioli. The Manchego cheese is well-developed, but not overpowering. Overall, the burger is powerfully artisanal, and, as such, stands as the only burger on the menu. Hours: Monday-Thursday: 12 noon-10 p.m.; Friday-Saturday: 12 noon-11 p.m.; Sunday brunch: 11:30 a.m.-4 p.m.; Sunday dinner: 4 p.m.-9 p.m.